Hibernians FC as they lined up against Floriana in the Cassar Cup on February 17, 1960. Back row: J. Privitera, F. Mizzi, L. Theobald, J. Muscat, S. Anastasi, J. Bugeja. Front: Caruana, L. Sultana, J. Mizzi, E. Theobald, F. Xuereb. Before the penalties rule was introduced in the 1970s, drawn cup ties were replayed until a final decision was reached. This, of course, created a lot of problems in the fixture list but it also increased the interest of the spectators. Sliema Wanderers won the 1959-60 Cassar Cup after beating Valletta in the final but the game which attracted most interest was the preliminary round match between Hibernians and Floriana which had to be replayed twice before the Paolites finally made it into the semi-finals. 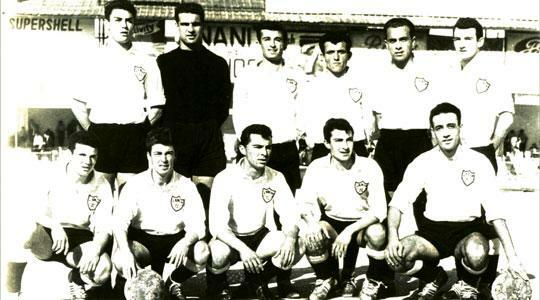 Towards the end of January 1960, the league was suspended to make way for the Cassar Cup. This was the longest edition in the history of the charity competition and it took nearly a month to complete. Since Hibernians, Floriana, Birkirkara and Marsa finished the 1958-59 league competition joint fourth, a knock-out preliminary round was held to determine which team would play in the semis. Floriana eliminated Marsa 6-2 and Hibernians beat Birkirkara 3-1 to set a direct clash for a place in the last four. The first game was played on February 3, 1960 and it ended in a 1-1 draw. Floriana, however, would have won but for a mistake by referee Arthur Lentini. Malta's first international referee must have been the most hated man around Floriana the following morning. During extra-time, with the score still standing at 1-1, Leli Attard, of Hibs, played the ball with his hand in his penalty area. It was a blatant penalty if ever there was one! Attard stretched his hands above his head to stop the ball going past him but the referee, to the surprise of all, including the most biased Hibs supporter, let play go on. Hibs were lucky to survive but they did not come out unscathed from the encounter. Their dashing centre-forward Freddie Church fractured an ankle and was ruled out for the rest of the season. Regular goalkeeper Lolly Rizzo also fractured a bone in his hand when he went down to save a hard shot from centre-forward Tony Cauchi. The replay was held on February 17, 1960 but after another 120 minutes of gruelling football the game ended again in a 1-1 draw. Once again, Floriana should have won this game. It is enough to say that on two separate occasions both Johnnie Privitera and Joe Bugeja cleared a sure goal off the line. Another unstoppable shot by Lolly Borg smacked against the bar and substitute goalkeeper Freddie Mizzi made two superb saves which bordered on the miraculous. Mizzi was then still at the start of his long and brilliant career with Hibernians. In contrast, Greens keeper Albert Borg had an easy afternoon. In fact, he hardly touched the ball during the game bar the Eddie Theobald shot which beat him. And so we come to the third and final round of the contest. The second replay, which was played on February 19, was really the game nobody wanted. Both sides were feeling the effects of the previous encounters and when the legs get weary tempers become frayed. Both teams entered the stadium that day as if they really hated each other. The game started rough and things escalated so much that by the end of the game each side finished with 10 players. Xuereb, of Hibs, and Bonnett, of Floriana, were both given marching orders. In the first half, Floriana were once again the best team on the field. The Hibs forward line never looked likely to penetrate the Floriana defence in which Bonnett was the outstanding figure. Six minutes from half-time however, the trend of the game changed. An inswinging free-kick was taken by Sunny Anastasi from the left edge of the Floriana area which completely deceived Borg in goal to finish at the back of the net. In the second period, Hibs improved considerably and deservedly obtained a second goal which sealed the game in their favour. Leli Sultana centred for Jimmy Mizzi to smack a low shot past Borg. Floriana made a great effort to save the match but Hibs held on to their two-goal lead until the final whistle.